A wonderfully warm (well, hot actually) performance in the Spiegeltent as part of the Sydney Festival brought about the unlikely combo of a Sydney jazz band and a number of elderly ceremonial performers from the Tiwi Islands. 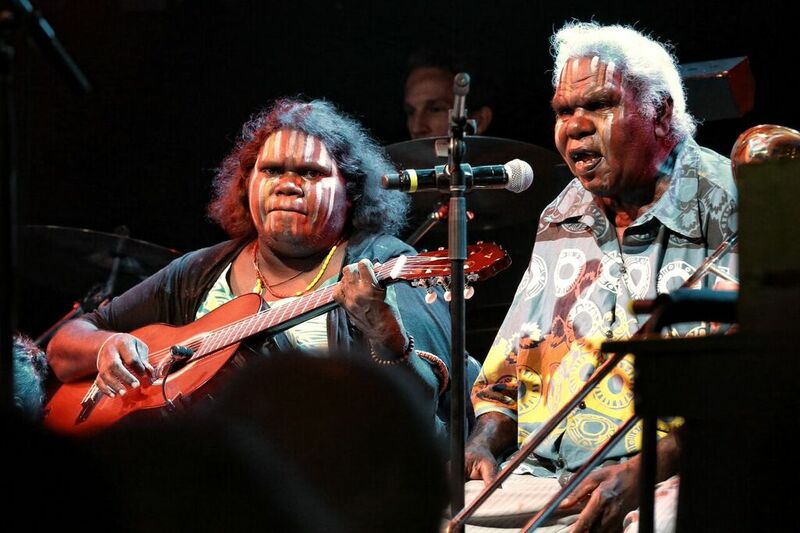 You wouldn't know it from the photos, which show only the front-of-stage hugging Tiwi; but behind them an 8-strong band added orchestration to some songs, improvised wildly around others, and generally added value. But in many ways, the strength of the performance lay in its history. 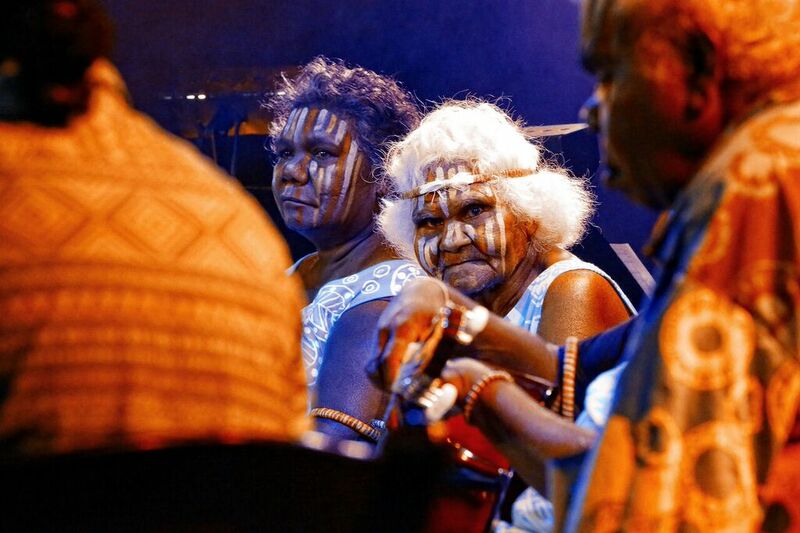 Horn-player Genevieve Campbell had been working with the Tiwi Wangatunga Strong Women's Group for a number of years and accompanied them to Canberra to listen to and copy archival recordings from Bathurst and Melville Islands. The repatriation of this material then informed a collaboration in which the Tiwi elders not only discovered their ancestors' voices going back as far as 1912, when Chief Protector Walter Baldwin Spencer recorded much anthropological material – and some of their own youthful voices from 1954 and 1975 – but decided they had material strong enough to offer it up to the alien competition of a big band. Amazing how different the Western side drum sounds from a traditional clap stick, even when both are simply keeping the beat. The big band, too was brave. They were at the mercy of a classic Aboriginal improvised event, with discussions about what should happen next or whether songs were being sung correctly occurring throughout! But they were also the improvisers – with especial success being achieved by bass clarinet (Jason Noble), trumpet (Casey Nicholson) and violin (Michelle Kelly). The double bass (Dave Ellis) gave us a lumpy German lullaby at some length, and the Tiwi hung in heroically while he improvised. But they got their own back with their own lullaby – first an archival recording and then what could have been a great-grandmother comforting her distant offspring with the promise: “Lizard will close your eyes”. Close analysis might suggest that Tiwi singing has changed over the years of the 20th Century during which their past was recorded. Their opening live number had a distinctly Hawaiian/Pacific lilt to it; while one of the earlier recordings was clearly being sung on a single note – so intensely different to the wild break that eventually escaped from the band in the background. I was wondering what on earth the Tiwi might be making of this cacophony. But they soon got their own back with a series of animal songs and dances – lead by the elderly Eustace Tipilopura – described in the program as being alone with Calista Kantilla and Leonie Tipiloura in “having the full knowledge of the old song language at Wurrumiyanga”. He gave us good value for this knowledge, conjuring everything from crocodile to jungle flowers, and inspiring the ladies to a full range of dance moves on a very limited stage. By the end, the audience, too wanted to dance – though whether they were dancing Tiwi or big band wasn't really clear. Hopefully, though, they came away with some sort of understanding that, for the Tiwi, "What we sing is who we are" - whether a song was sung in 1912 or on Wednesday, it's always 'now', always in the first person and in the present tense. Elvis has never left the theatre at Wurrumiyanga! Sadly, though 'now' in the Spiegeltent didn't include the wonderful Buffalo Dance that Baldwin Spencer photographed on his 1912 expedition (see photo) - though Genevieve Campbell has been on to say that Cynthia Portaminni is a regular Buffalo Dancer (Yoi Jarrangini), which is not exclusively done by naked males! Indeed, she included a decorous excerpt in the Spiegeltent.